In 2004, Dan Buettner and National Geographic identified five areas in the world where people live long and well. Those areas, called Blue Zones, include Sardinia, Okinawa, Japan, Loma Linda, CA, the Nicoya Peninsula in Costa Rica and the Greek island of Ikaria. In all these regions research showed that residents lived far longer than the average life span of most Americans. Why? Because they share these common practices: They eat a plant-based diet, exercise regularly, have a sense of community and purpose, are more peaceful and stress free, maintain connections with family and friends and participate in religious or spiritual activities. Today the concept of Blue Zones is expanding into communities where people want to duplicate the experiences to live longer and better. For example, in Beach Cities, CA, the community’s commitment to health resulted in a 14% reduction in obesity and a 30% reduction in tobacco use. Similarly in Albert Lea, MN, residents were able to reduce health care claims by 49%. And there are many other examples. 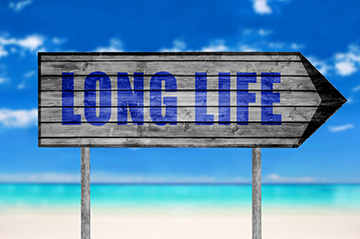 In the end, expanding life expectancy is about a adopting mindful lifestyle—one that involves personal choice and commitment to health and well-being. For more information, check out my book, Chronologically Gifted—Aging with Gusto: A Practical Guide for Healthy Living to Age 123!